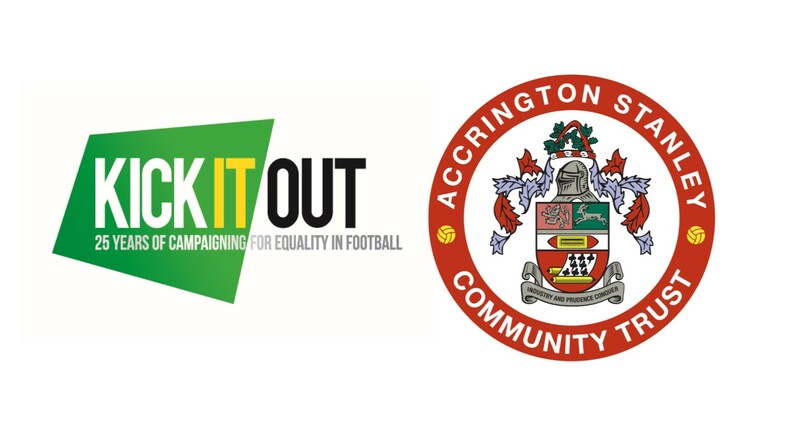 This season marks the 25th anniversary of Kick It Out, this weekends game against Fleetwood is our dedicated fixture. Having started as ‘Let’s Kick Racism Out of Football’ in 1993, Kick It Out has evolved into an organisation which – Premier League, the English Football League, The Professional Footballers’ working alongside its partners The FA, , the League Managers Association and the Football Supporters’ Federation, among others – fights ALL forms of discrimination in the game we love. As part of the Kick It Out ethos, last year we introduced ‘Stanley together’ a project that aims to involve more black, asian and minority ethnic groups (BAME) in football. Accrington has a large ethnic population however, this isn’t represented on the Stanley terraces. With the help of the Premier League Fans Fund the trust is able to spread the word about Accrington Stanley! Since receiving the funding we have been working closely with the Raza Jamia Masjid mosque to provide access to free match day tickets to all Stanley home games. Up take of these tickets have been greatly received with tickets been used almost every home match. In addition to the tickets, we are also setting up a BAME supporters club at the mosque with the aim to link it with the official supports club. We are currently looking for volunteers to help us set this up and help us educate people about Accrington Stanley and football. We will be going into two local schools, Springhill and Hyndburn Park, to carry out workshops with the children to raise awareness of the football club and learn more about the Club itself and the opportunities that they can access such as where to go to receive free match day tickets. We hope that by reaching younger BAME, they will over their lifetime become a Red and encourage and teach others who Accrington Stanley are. Further to this, we are able to extend our junior redz young supports scheme to improve their pre match fan zone and support the upskill of a cohort of volunteers. We hope to get 50 BAME junior members over the next year through our workshops and engagements at the mosque. The Raza Jamia Masjid mosque open its doors to its community last week as it welcomed Stanley fans from all backgrounds to look around and learn more about the asain community and their culture.